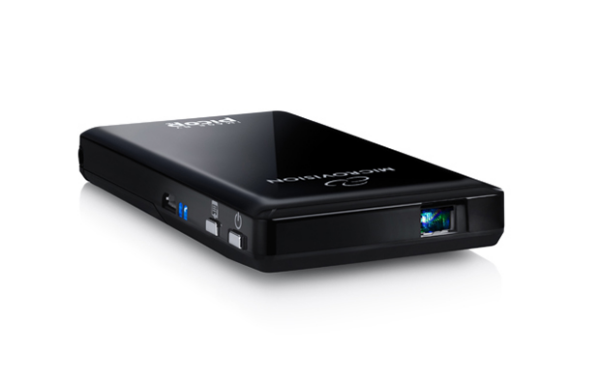 Sporting a similar shape to an iPhone, the MicroVision SHOWWX+ HDMI Laser Pico Projector could easily be missed among the sheer number of similar-looking consumer electronic devices sitting on the shelves of your local retailer. But this rectangle-shaped, shiny pocket-sized device could in fact transform your viewing experience, as it takes the small screen of the iPod, iPad and iPhone, as well as compatible HDMI devices, and projects it to the larger area of a wall, ceiling, or any other surface. Unlike home projectors, which are far too big to lug, the idea of the SHOWWX+ is to display that big screen wherever you want at your convenience, thus eradicating the need to huddle around a friend's smartphone trying to look at photos, or simply giving you the convenience of being able to watch a movie stored on an iPad on the ceiling of a hotel room. MicroVision SHOWWX+ HDMI is in fact a portable projector that uses video mirroring to display images from a range of devices and project them at a resolution of 848 x 480 onto any surface you point its bright laser at. Out of the box, the SHOWWX+ shows all the signs of being a simply designed and convenient plug-and-play device. Measuring 0.6 x 2.4 x 4.6 inches and weighing 122g, it’s certainly small enough to fit in your pocket with plenty of room to spare. And its portability is made all the more apparent with the small bag and wrist strap that comes included, which ensures you can pack in both projector and lead and still carry them around comfortably. The projector is fairly plain in design, with a glossy-black surface on the front adorned with the silver MicroVision logo, and a matte black finish on the back, where you’ll also find a fiddly-to-open battery compartment. Though the design isn’t cutting-edge or particularly stylish, it’s the size and weight that immediately impresses. And though its smartphone-sized chassis and flimsy battery compartment gives the impression that it’s quite a fragile device, it’s actually more robust than it looks (yes, we have dropped it accidentally on more than a couple of occasions). The projector comes equipped with three ports and all the leads you need to get going, including one USB port for charging, a mini-HDMI output for attaching compatible devices and a proprietary port for attaching to Apple products such as the iPhone and iPad. The standard 30-pin connector lead is much thicker than the thin and fragile cable that comes with your Apple device, so should be tough enough to last through some heavy use, and all the leads are a decent length so that you can tether your mobile phone to it without worrying about dangling cables. 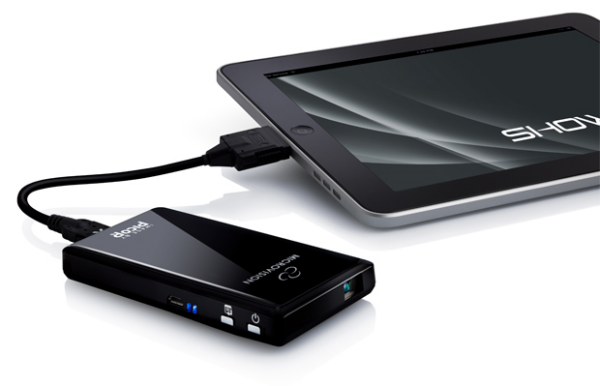 The projector can also be charged through a wall socket, and the adapter is included as part of the bundle. Aside from the three ports, the SHOWWX+ has a menu button, power on/off switch and two arrow buttons which allow you to move through the menu and change some of the settings. There’s also a 3.5mm stereo jack for connecting a headset, as well as the small square projector window on the front of the device that omits the beam. Though everything is included to get you started, there are a couple of things that you might need to buy for extra functionality. There isn’t a VGA adapter for connecting to a PC, for example, but the main omission is the lack of a tripod, which means you may spend an inconvenient amount of time trying to find a level surface that is the same height as where you want to project the image. We’ve found that a pile of books has more often than not done the trick, but it's not an ideal solution.